This article appeared in the August 15, 2009 print edition of the Bucks County Courier Times and online at Phillyburbs.com. Maria D’Andrea turned her interest in swimming into a passion that has taken her to a whole new world. And she didn’t let a disability get in her way. The Bensalem student competed at the International Federation for Sport for Athletes with an Intellectual Disability Global Games in Liberec, Czech Republic. D’Andrea has attention-deficit hyperactivity disorder and stutters. 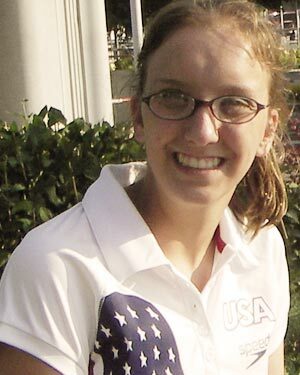 She finished eighth in the 800-meter freestyle in 11 minutes, 55.98 seconds. She was also 10th in the 400 freestyle (5:57.24), 11th in the 50 freestyle (33.58), 14th in both the 200 backstroke (3:27.40) and 100 freestyle (1:17.27), 16th in both the 50 breaststroke (54.58) and 50 backstroke (48.64) and 18th in the 100 backstroke (1:38.09). “I did really well,” D’Andrea said. “I was kind of surprised to finish eighth in the 800, because the competition was really, really tough. D’Andrea competed for Bensalem’s high school team, but is now out of eligibility. She wants to continue swimming competitively. She had competed through Special Olympics in the past, but has proven to be too strong a swimmer for that level. “Special Olympics is a great, great program, but over time, it wasn’t competitive enough for her,” said her father, Jack. “I was on the Internet and found this program [Athletes Without Limits & INAS-FID]. I thought it was too good to be true, but I looked into it and everything checked out, so we thought we’d give it a try. “This really was worthwhile for her. She was really thrilled to get a passport, and I know she had a good time. Right after she came back, we drove to Florida for a conference on stuttering. We were in the car for three days, and I don’t think two minutes went by where we didn’t hear about the Czech Republic and swimming. “Swimming has opened doors for her. When she came back from the Czech Republic, she told me she was sorry she hadn’t won any medals, but that doesn’t matter to me at all. She will continue getting essential subjects taught to her at Bensalem, and will soon be starting a job at Philadelphia Biblical University. “I’m excited to have a job, and I really don’t think I could have done that without the confidence I got from swimming,” she said.